(xi) Allama Iqbal delivered his presidential address at Allahabad in Dec.
(xii)East Pakistan was separated in December_____ A.D.
(xiii)Pakistan Recognized in second Islamic Summit Conference. (viv) The biggest mine is in khewra . Note: Answer 12 questions from this Section. 2. (i)Write any three characteristics of the Muslim society. (i) The beliefs, customs and culture of the Muslim society are based on teachings of Islam. (ii) In the Muslim society, there is preference of justice in individual and collective life. (iii) All the individuals in the Muslim society believe in the sovereignty of Almighty Allah. (ii) Describe three objectives of the establishment of the All India Muslim League. (c) To protect the right of the Muslims by seeking co operation of the government and other parties. 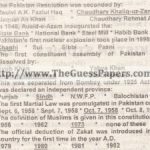 (iii) What is Two Nation Theory? Write in three sentences. There are two nations Muslims and Hindus in India. Their religion, culture and philosophy of life are different. The two nations cannot live together due to the basic difference given above. (iv) Name 3 types of environmental pollution. Air Pollution: The addition of such elements on components in air, which put injuries influences on human life, animal and plants is called air pollution. Water Pollution: Water which is obtained naturally from rivers, seas, lakes and springs, the addition of such elements and compounds in water which put injurious influences and human life is called water pollution. Land Pollution: the earth is polluted biologically, chemically and physiologically, when a number of harmful things are inducted earth. (v) Write three names of SAARC countries. Pakistan, India and Sri Lanka. (vi) Name three important exports and imports of Pakistan. (vii) Mention three important problems faced soon after the Creation, of Pakistan. (viii) Write three sentences on the Pakistan Resolution. (1) To revive the teachings of Islam and prepare the Muslims to pass their lives simply according to the teachings of Islam. (2) To protect the Muslims from the worship of things except Allah. (3) To preach Jihad because it was not possible to get freedom from evil force without armed struggle. (xi) Write down Three important points of Objectives Resolution. .ln the history of constitution making in Pakistan, the Objective Resolution is an important document and a basic step to frame the constitution. It was approved on March 12, 1949. In this Resolution Islam was declared as the foundation of the Constitution of Pakistan. It was also declared that all powers and sovereignty rests with Almighty Allah. It was also declared that the principles of democracy. Equally and social justice which are described by Islam would be implemented in Pakistan. So that the people could reform their lives according to the teaching of Islam. (xii) Write down Three advantages of forests. (iii) Forest provide number of products like honey, silk worn, herbs and firewood. (xiii) Name any 3 important High ways of Pak. (xiv)Name three religious festivals of Pakistan. (1) Eld-ul-Fitar: It is celebrated after the month of Ramazan ends and on the first of Shawwal. This is a reward in the form of blessings of Allah to those Muslims who keep fasting for the whole month of Ramazan. (2) Eid-ul-Azha: It is celebrated on the 10th, of the month of Zil-Hajj in the memory of the great sacrifice of Hazrat Ibrahim, when he offered to sacrifice the life of his dearest son Hazrat Ismail to fulfil the decree of Almighty Allah. (3) Eid Milad-un-Nabi: It is celebrated on 12th of the Islamic month of Rabi-ul-Awwal with great love and devotion. It is celebrated to express happiness on the birth of our Holy Prophet Hazrat Muhammad (S.A.W.S). (xv) Write down three sentences on technical and vocational education. (i) Technical and vocational education helps in sustainable economic and industrial development. (ii) Technical and vocational education prepares individuals for the progress of the country. (iii) With the help of Technical and vocational education boys and girls get expertise in such crafts and skills which make their individual lives successful. Note: Answer any Two questions from this Section. All questions carry equal marks. 3. (a)Write a note on any One of the following; (i) Importance of Urdu as the National Language (ii) Pakistani Culture (iii) Information Technology. The importance of National Language is evident as at the time of creation of Pakistan, Muslims were introduced as a separate nation on the basis of religion, culture as well as language. Sir Syed, Allama Iqbal, Shibli Nomani, Quaid-e-Azam and a number of leaders preferred Urdu to Hindi and English. Thus proved that other than Islam Urdu is the next entity of Muslims of subcontinent. Urdu language is comprised of alphabets of various languages. It comprises of Arabic, Persian, Hindi, Punjabi, Sindhi, Baluchi, Saraiki and Kashmiri. Due to its easiness and simplicity it is used not only in Pakistan but also in most of the countries of the world. It is counted as an international language. Urdu is not a newly born language. We have received it in inheritance from our forefathers. In ancient time, the Arians came to Asia, they spoke Sansikrit with the passage of time, in addition with weal language, their came changes in it and them it came to be known us PRAKRAT. Urdu has a precious storage of poem and prose and it is gradually increasing. It is educational as well as official language of Pakistan as well as a symbol of unity and honour for the people of Pakistan. Culture and customs are lifeblood of a nation. These culture and customs distinguishes a country and nation from another. People of various nations spends their life in accordance with their religion, social and cultural requirements, as well as language plays an important role in a nations way of living. A country consists of provinces and provinces consist of cities, towns and villages various languages are spoken in different areas and cities and then in provinces. Through regional languages have heir own importance but their always exits need for a national languages. A national language is a symbol of unity among various parts of country as well as a communicating media among people of various regions of a country. Culture may be defined as behaviour particular to human beings, together with material objects used. Culture consists of language, ideas, beliefs, customs, codes, institution, tools, techniques, work of art, ceremonies and so on. (1) Pakistan came into existence to provide its people a system of life based on Islam. The people, inspite of some differences of languages, customs and traditions commonly follow one religion of Islam. (2) A number of languages are spoken in Pakistan. Some of them are Punjabi, Sindhi, Pusto and Balochi. But Urdu is spoken and understood in all parts of Pakistan. It is the medium of communication between all regions of Pakistan. (3) Literature is an important aspect of our cultural life. Most of our poets reflect Islamic code and trend in their poetry. They gave the message of love and brotherhood. (4) Dress is an important manifestation of culture. The regional dresses of Pakistan under go changes in the light of local tradition, economic conditions, way of living and wealth in tbe region. But in all Provinces people generally wear Shalwar Kameez. (5) In Pakistani culture, the male member of the family enjoys the key position. Family is headed by a male member and in most cases, he is the sole source of income for other members of the family. (6) Embroidery, leather works, glazed pottery, wood work, carpet making, metal crafts, ivory are the essential parts of our culture. Pakistani craftsmen are considered as the best in their craftsmanship. They’ are known for the high quality works which is very popular in foreign countries. (7) The games like wrestling, hockey, cricket, football, squash, kabaddi etc. are popular in every part of our country. These games reflect our cultural identity. (8) Education contributes a great deal in developing national character. Educational system plays a vital role in the formation of culture. Unity and solidarity of a nation. (9) Festivals are an important part of our culture. Eid-ul-Fitr and Eid-ul-Azha are our two main religious festivals. They are celebrated with great happiness throughout the country. Information Technology is an innovation in the field of telecommunlcatlon. Due to Information Technology, data can be transferred to thousand kilometers away through the internet. The importance of Information Technology has been recognized in Pakistan. Investment has started on priority. Computer Hardware and Software are being prepared. Seven Universities of Information Technology are being established out of which five in the public sector and two in the private sector. Two universities of Information Technology namely “COSMATS” and “FAST” have started functioning. Information Technology has been extended to over four thousands educational institutions, including schools in collaboration with private sector. The future of Information Technology is very bright in Pak. and a number of foreign companies are making investment in this field. 3. (b)What is meant by a welfare state? How can Pakistan be made a welfare state? (1) A welfare state provides equal opportunities for progress. For example education is a fundamental right of every citizen. (2) The first duty of every welfare state is the establishment of law and order situation so that the protection of life and property of every citizen could be made possible. (3) The establishment of such system of equality provides equal opportunities of survival to all citizens are the duty of a welfare state. For the establishment of supremacy of law, a free~udici1ry system is necessary so that each citizen could receive his legal rights. (4) In the modern period, no country can survive without the co-operation of other countries. Each country has its own free foreign policy which fulfils its national objectives. (5) A welfare states controls the economic activities in such a way which provides the protection of the right and interests of all classes of a society. (6) A welfare state provides all educational facilities to its citizens so that every citizen could get modern knowledge and training according to his ability. (7) It is the duty of a welfare state to improve the causes of international peace so that world could be a happy place and the human race could be saved from the destruction wars. 4. (a)Write principles of Democracy in Islam. (a) The Holy Qur’an: The Qur’an is the permanent basis of Islam. It provides detailed guidance to the people, concerning social and economic laws, leading to a sustainable, peaceful and purposeful life at the individual and collective levels. 4. (b) Describe the salient features of Aligarh Movement. After the war of independence in 1857, Muslims of the sub-continent became victim of atrocities of the British and other Political, economic and social condition were badly affected in these circumstances Sir Syed Ahmed Khan felt at the sad state of Muslims and started an awakening movement for them. Level of a college named Aligarh College. He maturated the Muslims to learn English language and scientific knowledge. He made great services in social way, thus Aligarh movement became a source of strength for the Muslims in the sub continent. There are following types of Environmental Pollution. The addition of such elements or compounds in air, which put injurious influences on human life, animals and plants is called air pollution. The covering of air around the .earth is called atmosphere. In atmosphere, there are many gases included like oxygen, nitrogen and carbon dioxide. Water which is obtained naturally from rivers, seas, Lakes and springs. The addition of such elements and compounds in water which put injurious influences on human life and marine life is called water pollution. Water is a great blessing of Almighty Allah and is an important need of human beings. The earth is polluted biologically, chemically and physiologically, when a number of harmful things are inducted earth. Air and water pollution are also the source of land pollution. Land is polluted through floods, earthquakes, volcanoes and fire.